An Ankara lawyer who wants to remain anonymous has said his/her client, detained over his links to the Gülen movement, was waiting his turn in fears to be tortured at a detention facility in Turkey’s capital. 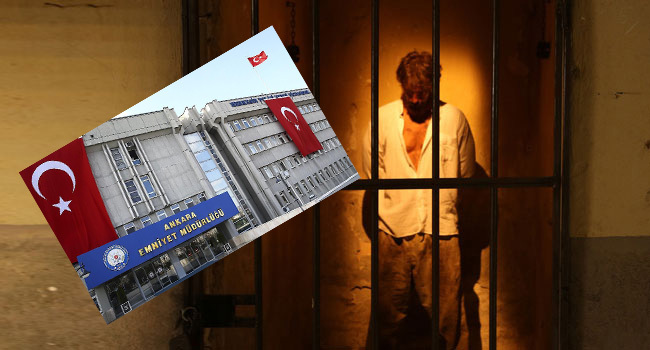 In his/her letter to the Human Rights Association (İHD), the lawyer said people detained as part of an investigation into the allegedly secret imams of the Gülen movement within Turkish police were subjected to maltreatment at Ankara Police’s Financial Department building’s custody. Below is the full text of the translation of the lawyer. “I am lawyer registered to Ankara Bar Association. When I visited my client, B.O., in the Ankara Police’s Financial Department building’s custody he told me in tears that the people he is staying with in the holding cell were subjected to torture and maltreatment. He declared that he is waiting in fear that his turn will eventually come. “My client was detained during the operation at his home in the morning of Apr 26, 2017. He was taken away from his home as part of the operation, dubbed in the media as the operation against FETÖ’s police imams in which nearly 1,000 people were detained. “According to my client, he is being held in a 6-squaremeters room with 14 others. When most of the personnel leave the station at the end of the daily shift, especially at nights, they are individually put by police to separate rooms; stripped naked in these rooms where police put a sack over their heads with their hands cuffed behind back to the chairs; tortured in their private parts with a technic called “the bottle”; and beaten for hours before being sent back to their holding cells, according to my client who also said every detainee is subjected to such treatment. “It is very likely that my client will be subjected to the torture and maltreatment in a similar way. According to my clients, one of those detainees lost his consciousness after coming back from one of such rooms. He vomited for two days due to the blows he received to his head. But, he was not taken to the hospital with only emergency unit having given a quick treatment. “…I ask your association to raise awareness about the protection of human rights and about this subject in particular,” the lawyer concluded. Turkish government accuses Gülen movement of masterminding the July 15, 2016 coup attempt while the latter denies involvement. FETÖ, a derogatory buzzword coined by President Recep Tayyip Erdoğan, refers to the alleged Fethullahist Terrorist Organization that takes orders from US-based cleric Fethullah Gülen. Several human rights organizations earlier documented torture on Turkey’s post-coup detainees while the government denies such claims. Cevheri Güven, a Turkish journalist in exile, interviewed an alleged victim of torture who was briefly detained in Ankara and was subjected to similar treatment in a 1000-person detention facility, last week.